I understand we all want to Get The Best Out of Exercise. Lets face it, sometimes that can be tricky! Conflicting theories on how to maximize your workouts would stretch anyone to the limit. Here is some information on stretching and whether you should be doing it as part of your Warm – Up. Should I Do Stretching As Part Of My Warm-Up? Many people perform stretches before running out on to a court or field. Sport scientists say there is no evidence that stretching reduces the risk of injury. What’s interesting is it can undermine performance, particularly in sports requiring bursts of power and sudden changes in direction. 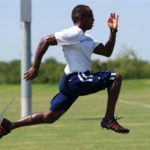 Static stretches reduce muscle stiffness, thereby slowing the speed at which they can transfer force and reducing the power of their contractions. One review found that pre-exercise static stretching such as pushing against a wall or holding leg stretches reduced muscle strength by 5.4%. In general its almost always better to stretch after a workout and use it as a tool to recover, not get started or warm up. Stretching increases the range of motion in joints, but it has its biggest effect in muscles that are already warm and so is better done after exercise. So my answer is no, stretching should NOT be done as part of your warm-up. From reading the above I hope you can see that there isnt 1 best way to do anything and that adding variety is important and so is being flexible with your ideas and methods. If you have any questions please comment below. If you need help with your workout click on the following link and give us a call or email.